Project Pengyou WSU Chapter’s first social event! Pengyou Day! 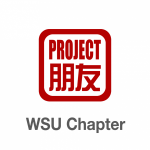 For WSU’s first Pengyou Day, we will be playing “Speed Pengyou!” an adaptation of speed dating in which Americans interested in China and meet and engage with Chinese interested in America in a fast-paced yet casual setting. Let the friendships begin!